A charming flower arrangement that is perfect to lift up the mood. 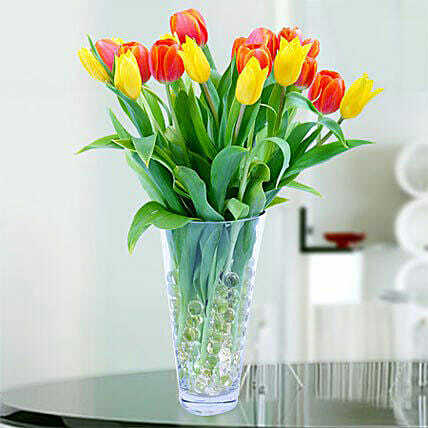 Brighten the day with our gorgeous, fresh and colourful tulips in an elegant glass vase. This arrangement of flowers provides an experience of pleasure and satisfaction and delivers your message in the best way possible. This tulip flower arrangement blooms with a brilliant colour celebrating grace and elegance. ï¿½What sunshine is to flowers, smiles are to humanity. These are but trifles, to be sure; but scattered along life's pathway, the good they do is inconceivable.ï¿½ Joseph Addison Meaning of flowers: Yellow tulips represent cheerful thoughts and sunshine and orange tulips mean energy, enthusiasm, desire, and passion.